The "International Mediterranean Sea Cetacean Sanctuary" is a kind of sea triangle that, in the 1999 november, the governments of Italy, France and Principato di Monaco, declared (with an agreement) protected marine area, proposing to themself important aims. His dimension is about 96.000 km/q (the 4% of all the mediterranean sea) and is placed in the ligurian-corse-provençal including also international sea. 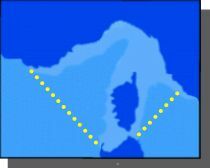 The under guardianship area, is delimitated by two ideal lines departing in the west side from punta Escampobariou (43o 20' 00'' N, 004o 50' 30'' E) near the mouths of the Rodano (Fra) to Capo Falcone (40o58' 00'' N, 008°12'00''E) in the north-west coast of Sardinia (Ita) and in the East side from Capo Ferro (41°09' 18'' N , 009°31'18''E) in the north-east coast of Sardinia to Fosso Chiarone (42o21' 24'' N, 011o 31' 00'' E) in Tuscany (Ita).